If you are looking for an exciting, vibrant and professional Indian Wedding DJ then AK Musik are the number one choice for your Indian Wedding celebrations. AK Musik respect and understand the importance of your wedding day and promise to deliver a classy and dynamic service that will add an electrifying element to your event. Not only do AK Musik offer quality audio equipment but we also use only the very best in visual and lighting aids that will bring your party to life. Renowned UK and International DJ Arun Kalyan began his DJ journey as a hobby in the 90s but his instinctive creative skill soon gained him a valuable reputation and he shot to great heights which enabled him to create AK Musik. We are utterly dedicated to providing you and your event with an unforgettable experience. 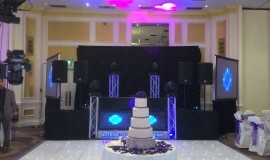 For your Indian Wedding DJ requirements we carry a selection of packages that are uniquely created to suit all weddings, whatever the size and scale. Whether you are catering for 100 guests or 1000 upwards we have the perfect package for you. We also include the diamond package, this is a fully customisable service that you can shape to suit your specific needs. AK Musik have a vast amount of experience in providing entertainment for Indian weddings and we know exactly how to make your day truly special. Your wedding is a day that unites you and your loved ones in unique celebration and we strive to encapsulate and enhance the euphoria of the event. We work with your personal ideas to create the right package for you. We serve you with the very best in Indian Wedding DJ services by thoughtfully fusing a variation of music styles to bring you the best atmosphere, accompanied by staggeringly stunning light shows and graphics. Choose from LED walls and curtains or LED dancefloors to really enhance the effect. The exciting visuals add that amazing extra touch to any event. Plasma screens and projectors present you with a live feed of the cameraman and for a really different touch our LED vision cloth will wow everyone with its bright videos, texts and graphics. Ultimately we offer our Extreme LED Platinum Plus package which is suitable for 1500 guests and brings you every element of our first class sound, lighting and visual range to bring you that exciting club experience. Visit akmusik.co.uk for more information.